← Design Culture Salon 13: How does age influence cultures of design? Contemporary design culture seems to be in a constant state of anticipation, on the look-out for the ‘next big thing’. The design media frequently compiles lists of the ‘ones to watch’ through which they promote the culture of ‘beginnings, creativity and risk’, the tagline of new magazine The Great Discontent. Here, design celebrates the young. However, an alternative image and function for design has been nudging into view lately. Selfridges is celebrating ‘Bright Old Things’ and fashion design is finding its muse in a notably older generation. Likewise, many of the discussions which have taken place in previous Design Culture Salons have been interested in winding down or interrupting the intense speeds at which we are accustomed to talking about design. They seem to have suggested a more considered, responsible function for design discourse- whether through design philosophy, policy making or permaculture. So what does this tell us about the relationship between age and design culture? What priorities and privileges does it reveal in our social values? How helpful or misleading is this correlation between age, innovation, creativity and design? Salon number 13 acquired an entirely unexpected energy due to the fact that three of the panelists – Joe Smith, Laura Jordan Bambach and Lynda Relph-Knight- had all, for different reasons, been forced to cancel on the day. We were extremely lucky to bring in two fantastic replacements- designer Alasdair Scott and artist, activist and many other things, Susan Benn. Both seemed to encapsulate the qualities we were seeking to unpack and examine in this Salon, bringing a wealth of experience which cut across creative, artistic and design practices. Malcolm Garrett, chair for the evening, was also ideally placed to speak about this issue. In his introduction, he reflected on his own career trajectory- describing the transition ‘from student to master’ (Malcolm is Master of the Faculty of RDIs at the RSA). Malcolm’s early career was also strongly shaped by his association with the late 70s music scene in Manchester and the punk movement aesthetic. Being part of a ‘generation’ has clearly played an important function in his career. To start things off, Malcolm asked Alasdair Scott to reflect on how things have changed over his career and how he thought age has impacted the direction he has gone. In his response, Alasdair raised the significance of technological advancements, which shape the medium through which a ‘generation’ can find its voice. Expanding on this, he also made the important point that cultures of age are, of course, contingent upon social and economic conditions. When we talk about ‘age’, we are really talking about history. This might be used to make sense of the ‘being in the right time, in the right place’. Professor Sean Nixon probed a little further into this theme. He was well placed to do so, since much of his work has focused on the lifestyles, attitudes and behaviours of those working in advertising. Here, he argued, youthfulness is valorized and celebrated above all else. This is not only visible in the emphasis on ‘creativity’ and ‘New Blood’ pushed by institutions such as D&AD, but also in the demographics of the industry, which puts the average age at 34. This fascination with youth is problematic, not least because of the limited capacity for representation it offers. It is, however, a central component of the ‘myth making’ that goes on in these industries, which presents creativity as a ‘moral imperative’. Next to speak was Susan Benn, whose work in founding the PAL Labs has brought her into contact with a wide range of artistic practices and age groups. Malcolm asked her how she had managed to sustain her youthful energy throughout her varied career. Susan said she had always resented the very notion of growing up and has, throughout her life, felt that whatever the problem, the ‘grown-ups have got it wrong’. For her therefore, the idea of being a ‘grown up’ was an attitudinal, rather than an age-related, issue. The fixed priorities of older generations can be stifling for young people in the fields of art, design and film. People rarely stop to ask the young ‘what do you care about?’. Susan also criticized the invention of words such as ‘creativity’, ‘collaboration’ which try to mechanise and formalize what is essentially natural human behavior. The conversation flowed, moving through several themes, including the function of design awards as a ‘rite of passage’, (or perhaps ‘rite of consecration’, as Pierre Bourdieu would have it), in design. Alasdair noted that he used to receive awards, now he gives them out- that’s a marker of age. The discussion also veered at times into the ‘myth-making’ Sean had described. Malcolm and Alasdair reminisced about the ‘good old days’ in Shoreditch, when they were the first graphic design company to set up on Curtain Road (an area now pulsing with this sort of activity). However, Alasdair also bravely made the point that his own generation, the 40-something, has stubbornly clung to their youth, to the extent that younger generations now have to be ‘more extreme’ to represent youth culture. The question of risk also became a major discussion point. Malcolm asked the audience, which was composed of many young students, to reflect on the last time they had taken a risk. There was a prolonged silence. One student from Goldsmiths admitted that people of her generation were consciously risk-averse. Guy Julier reminded us that Joe Smith, the youngest panelist on the original Salon line-up, had to cancel the last minute because of a meeting with his accountant! Time and money appear to be luxuries more freely available in previous generations. Some students sitting in the front row said that their overwhelming attitude was one of fear and anxiety for the future and their place in it. They feel a great weight of social responsibility on their shoulders, rather than the youthful naivety and confidence Malcolm had described in his introduction. ‘It’s too late’, they said, ‘We feel that we don’t have enough time’. Malcolm agreed that this was one of the most profound shifts he had identified through his work with the RSA. ‘Whereas we in the punk movement just wanted to change things, young designers today want to change things for the better’. It’s a great quote that neatly summarised the social imperative that now drives design culture. So, this Design Culture Salon was notably different in tone from the others, as it became something closer to a conversation between two generations- the student and the master- to go back to Malcolm’s description. Some of the greatest sense of responsibility and ‘wisdom’ appeared to be coming from the youngest in the room. There is something very profound about this inversion- or perhaps, as Susan argued, it has always been this way. It was a sobering moment and certainly left me with much to mull over. This entry was posted in age, design education. Bookmark the permalink. 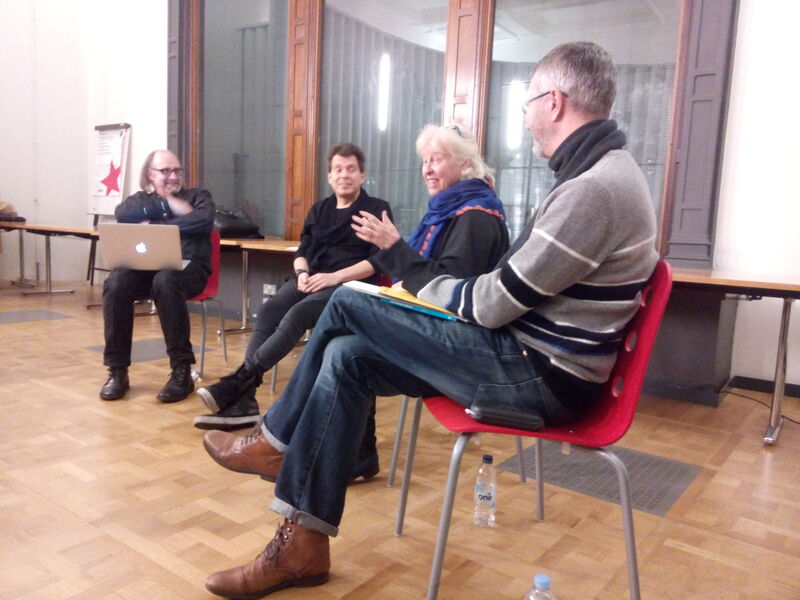 2 Responses to Reflections on Design Culture Salon 13: How does age influence cultures of design?